Alternate title: Free Fall Decor - With Kids! Jack has been really into pirates lately (did you know yesterday was National Talk like a Pirate Day?). It's either that we are following a map to Pirate Island, or that we are on a treasure hunt, or we point at each other with sticks and say 'argh!'. He also says 'yo ho ho' which is kind of hilarious. 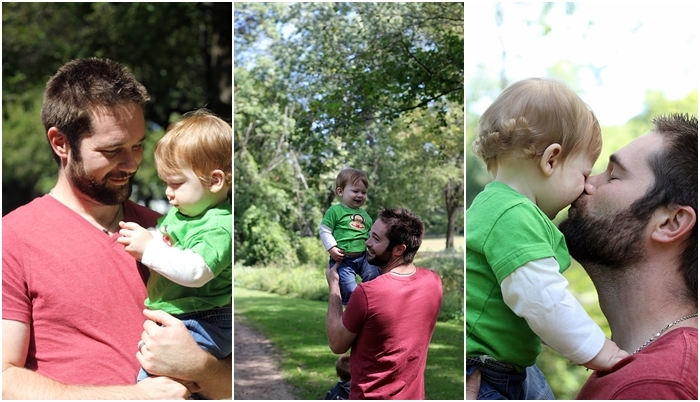 On Sunday we told him that we were going to go on a real treasure hunt for acorns at the park, and he was SO excited. 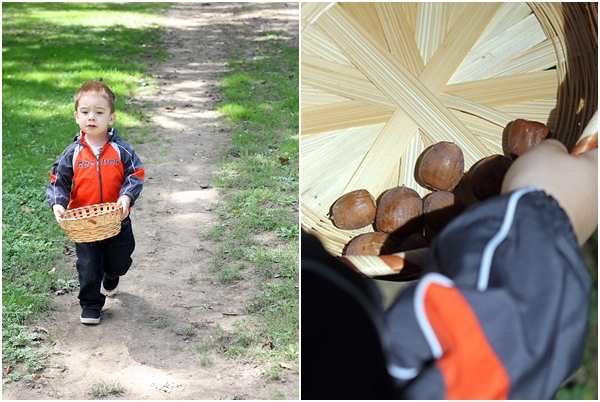 I had noticed previously that our park is just covered in acorns, so we packed up the boys, grabbed a basket, and headed out on our treasure hunt. Jack took this very seriously. He threw out almost every single acorn that I picked...apparently they were too dirty. He also refused to let that little basket out of his grip, it was pretty precious to see how much this meant to him. Luke was very intrigued by a pretty red leaf that had fallen, yes that's right, our leaves are already changing and falling. Crazy. Once we got home, we popped our acorns in the freezer for a while. Why? Oh. Well. Let me tell you. Last time I did this (decorated with acorns) I did NOT know to put them in the freezer, and a few days after we brought them home my kitchen counter was COVERED in tiny little grubs that had crawled out the acorns. It was just so so so gross. So gross. I just...ugh. Always freeze your acorns to kill any little hitchhikers in there. We let them freeze overnight, and then Jack helped me fill up a little fishbowl with the acorns. I put one of our favorite fall candles in there, and we have a cute little decoration AND an awesome pirate acorn treasure. We didn't spend a dime, and we had a fun time as a family. Win-win. And again - if you take anything from this post - FREEZE YOUR ACORNS. I still feel a little gaggy thinking about those grubs. you are amazing. i love you. jack is so big. how can this be?? and i can't wait to have a house to decorate again!! GAH! one week!!! I wish we could have hunted acorns together! So glad I read this post before going out and hunting for some acorns. I would have never thought to freeze them.